My youngest son went the dentist today and for the first time he had a cavity free appointment. While this is routine for my oldest son, my poor youngest son has had serious problems with his teeth since they came in. He never drank cows milk and still had to have two dental surgeries before his third birthday. Since then he has had fillings every six months. My dentist was determined that it was the food that he was drinking, but has finally been convinced that is has to mostly be genetics. My youngest eats healthier than any other child his age that I know and drinks a ton of water, very little carbs and a high protein diet. Luckily our pediatrician agrees with me and thinks it's 100 percent genetic and not my fault. I still hate the mommy guilt when he has to have another filling. I decided to make one of my son's favorite meals this week in order to calm him down before the dentist. My youngest absolutely loves soup, chicken noodle, vegetable you name it. This week I tried a new recipe for Moroccan Lentil Soup from the February 2013 issue of Eating Well magazine. This recipe has 18 ingredients. It takes 1 1/2 hours of total time, 30 minutes of which is active and makes 12 servings. Since vegetable stock is so expensive pre-made I made my own. It costs a lot less money and tastes so much better. I used fresh spinach since the taste of frozen spinach always seems off to me. Thanks to my forgetfulness I failed to add the lemon and cilantro to the finished soup. I did add it to the leftovers and the flavor was delicious. I added a little more time to my overall cooking time to ensure that the lentils were fully soft. For soup I prefer my beans very soft, I find the texture more pleasing when eaten. I followed the remainder of the recipe as written. I love that this soup is only 152 calories and 1 gram of fat per serving. Since it is full of vegetables and lentils it is filling and can either be used as a side or a main dish. I served it as a main dish and it was a perfect option for our vegetarian meal night. My youngest loved the cauliflower and ate all the pieces out first. This soup also makes a large batch so their are plenty of leftovers. 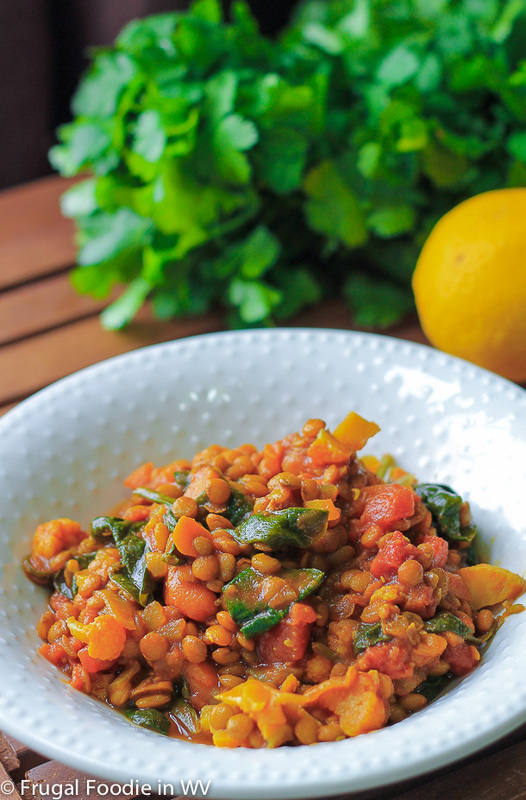 For the recipe go to Moroccan Lentil Soup. I love lentils! This sounds like it would be great on a cold winter day! I love lentils too, they can be used in so many ways! Ooh, I make a version of this too! Mine is a bit more soupy though, so this looks really good! The soup sounds yummy! I hope it cheered your boy up after his dentist appt. Sounds like he's had a rough go of it! My son did love it and he was happy that the dentist gave him stickers :) I'm just glad that he had a good appointment! Nice to meet you too :) Thanks for the sweet comments! Glad to hear that your son was cavity free! Dentist appointments are never fun. I agree, dentist appts are no fun :) I love lentils, they are great in so many things!